Untitled, originally uploaded by kmcgivney. Yesterday, I posted a photo of The Monument in London, which commemorates the Great Fire of 1666. While my boyfriend at the time (now husband) climbed its 311 steps on the day I took these photos, I walked around the area, taking photos of whatever caught my eye. This image is from a carved relief on the west side of the base of the monument. It is quite large, as you can see in this photo on Wikipedia. 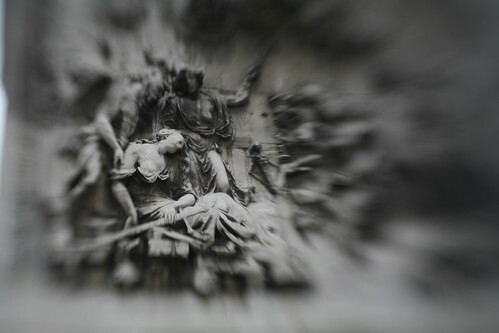 I captured this using a Lensbaby on my Canon 5D. To get the full effect of this image, you really need to see it larger, though. A larger version is posted after the jump. Mary Magdalene, originally uploaded by kmcgivney. While we were in Florence, we went to the Basilica di Santa Maria del Fiore, otherwise known as the Duomo. (The word Duomo is a general term for an Italian church, so you will see many references to Duomos all over Italy.) Though it is beautiful and has a wonderful architectural history, much of its artwork and statues have been moved to the Museo dell'Opera del Duomo (Duomo Museum) across the street. In this museum, we found many of the statues that are included in the Creepy Statues set, but this one stood out. Made of polychromed white poplar wood and completed around 1455, this statue is one of Donatello's most striking pieces. 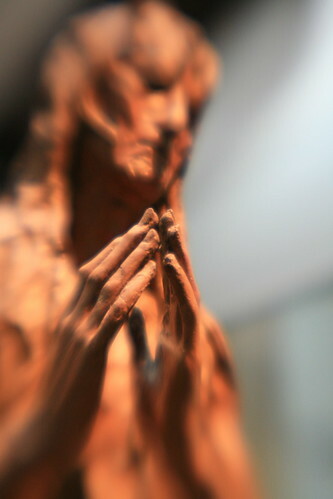 The sculpture was captivating - Mary Magdalene made to look emaciated and nearly toothless, clad in tattered clothing and with ratty long hair, yet still raising her hands in prayer, she is a mix of desperation and hope. I was fascinated by this sculpture and decided that my images should focus on her hands since they appeared to be the strongest part of her. 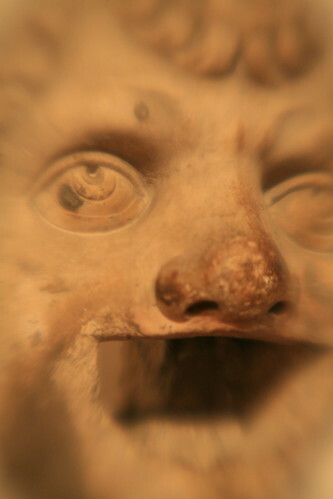 Taken with a Canon 5D and a Lensbaby. Statue, Florence, originally uploaded by kmcgivney. As anyone who has been to Europe knows, the place is full of statues. Lots of them have broken penises and noses and stuff, which is all well and good, but my favorites tend to be the really creepy ones. I am always drawn to them, and if you let me, I would sit and photograph them for hours. Fortunately, my husband usually drags me away before security does. So, to honor my love of creepy statues, I created a Flickr set just for them! Enjoy Adam and Eve as well as Mary Magdalene (more on this one later) and this yelling guy with no irises. Tell me which one is your favorite and/or which one gives you the worst nightmares.